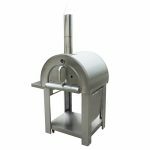 A refreshing change from some of the most substantially built outdoor pizza ovens on the market, we thought that we would take the time to try out the Stainless Steel pizza oven options found on Amazon in a bid to see if portability would allow for more use of the oven throughout the year. Once ordered, the oven arrived quickly and we were excited to be once again getting ready to eat our own body weight in freshly cooked delicious pizza, however this time around we were trying out something a little bit different, so we were excited to see what the outcome would be. Taking the fixed nature out of owning an outdoor pizza oven is a huge draw point to this, however the concept of the oven being on casters is not exactly what we expected thanks to the real brick surface that is supplied with the oven, which obviously increases the weight of the unit and thus makes it harder to move when not placed on a firm foundation. In terms of looks, it gives off a sense of a BBQ style appearance but with a whole lot better cooking experience thanks to the fact that you are cooking with real wood fuel, but we did find that once we had built the oven to the temperature required, there were two issues that we came across; one being that the space left within the cooking area was about enough for a single pizza to be cooked and the other being that without the insulation properties of brick and mortar, the oven does lose heat quicker than more traditional ovens, so make sure that you have plenty of wood on hand to keep that fire burning nice and warm. If you have ever built a BBQ up, don’t get pulled into the thought that this should be a breeze either as for us the building instructions weren’t really as detailed as we would have thought, meaning that if this is your first pizza oven you may have to spend a little time thinking about what needs to be where but lets not take away from the finished product too much, it does look great. Ideal for placing onto a flat decking or patio area so that you can push it into place from an area of storage on the same level (lifting this alone is not a good idea as it isn’t as light as you would expect) and the food that is produced from it is great. The pizzas were crispy at the crust and soft in the middle with the cheese melted perfectly but from experience, I would say that it does take a little longer than if you were to have a more traditional pizza oven waiting to service your hunger. Overall, a nice oven that does look great and can be moved about as required but for us there is no substitute for an authentic clay, brick and mortar.